Back for the summer, back from my nine-month stint in the Kitchenless Dorm Corps, ready to take on the greatest recipes and thrillingest adventures. But before we go on our grand foodie journeys together, let’s start small, shall we? I’m thinking comfort food. Asian comfort food. No, fortune cookies are not a thing. Something that goes really well with plain white rice. Let’s pretend like you didn’t just think soy sauce. Something classic and elegant and simple. No, generic brand “Sweeet ‘n’ Sourr!” sauce is also none of the above and is also super-sketchy and I don’t trust foods that can’t spell correctly. Can’t guess? Well too bad, because Cici is back and Cici is done playing games. Cici wants to do some real cookin’. And also Cici wants to speak in third person. Stir-Fry is one of the simplest dishes. 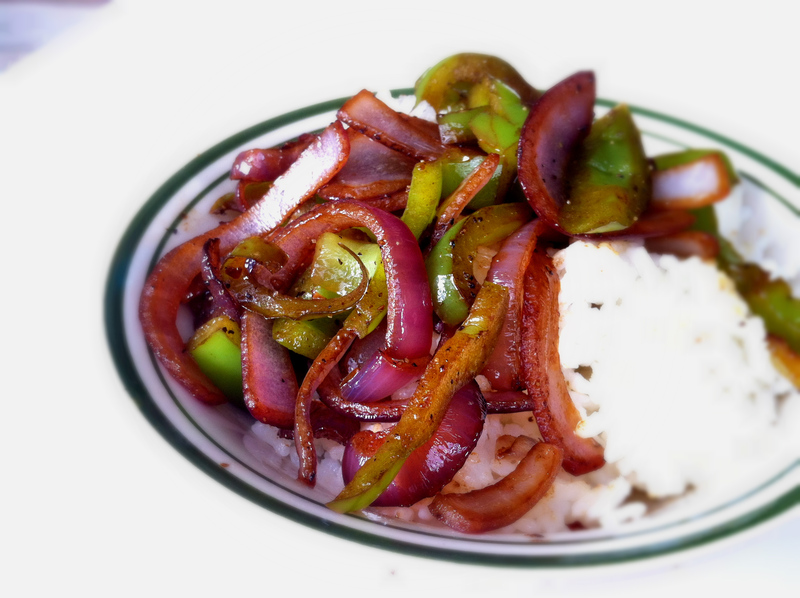 The onion-and-bell-pepper combo is one of Cici’s all-time favorites, beloved by Cici for its 10-minute preparation time. The onion’s aroma mingles with the crispy freshness of the bell pepper, and everything comes together in a flurry of savory smells and bold zing. It’s the perfect marriage. 1. Chop up the onions and peppers into similar shapes of your choosing. Also, mince the garlic. 2. Heat oil in a pan, throw in onions and peppers and garlic, and stir. These are the new fashionable Spring 2014 colors, according to Vogue. 3. After a minute, add the soy sauce. Season to taste. It’s all over the runways, you haven’t seen? Gahhhh. Look at those perfect crispy vegetables, stir-fried to a delicious brown color. This is the perfect mix of mm-mmm bold and sizzlingly good-looking, just how I like my men. I mean, comparing food to people is always a good idea. Your pictures are so pretty! What camera do you use :)? Thank you! I literally use my good old iPhone 4! 🙂 Yay for saving money!